Two stools made by Richard Raffan from camphor laurel, 285mm dia x 285mm high, and 285mm dia x 340mm high. When I was very small my father made me an oak stool, a four-legged version of the one shown above in photo 1. I was assured that for a year or so I used it constantly as a table, seat, and climbing aid — as did my sister, three years behind me, and our brother a few years after that. Then for a couple of decades and before we produced the next generation, our mother used it as a low side table and occasional footstool. The stool is now with my sister and her grandchildren are using it. The stool my father made for me has now been in constant use for 70 years and used by four generations — it’s become an heirloom. The surfaces of this simple project can be embellished with inlay, carving, or pyrography, or you can simply smother it with beads and coves. It’s a piece of furniture useful at any stage of life. The main reason for having three (rather than four) legs on a stool is that it will always stand firm on any surface, and there won’t be a problem should the top warp slightly. The top is turned flat so it can support mugs, glasses, bottles of gin. 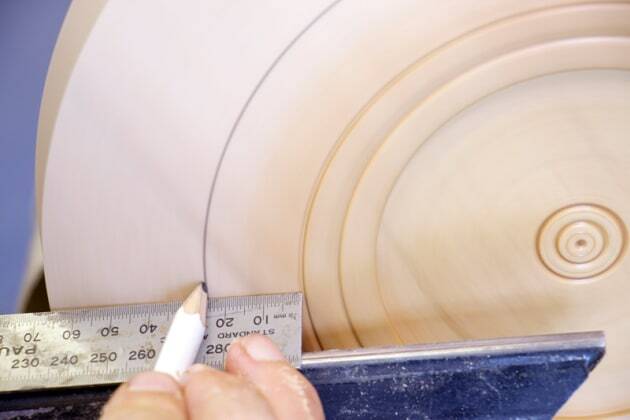 The top can be anywhere between 230mm and 300mm diameter, so it’s a project that can be done on a mini-lathe. Here you see a Vicmarc VL150 with a swing of 300mm. This project is a combination of facework and centrework and I turned it using only the three tools above in photo 2: a 1/2" spindle gouge, a skewed 1" scraper, and a 1" skew chisel. You turn the top first, drill the mortises/ holes for the legs, and then turn the legs to fit the mortises. Once the stool is assembled the ends of the legs are trimmed so they sit flat on a floor rather than perch on a fragile edge. The timber for this stool needs to be well seasoned. Preferably the blank for the top should be quartersawn (with the annular rings on the endgrain near 90° to the two faces); then if it does move it’ll go oval rather than cup. These blanks were cut from a seasoned board of camphor laurel 40mm thick. A 50mm thick board would have allowed me some margin for error when turning the top. And I’d have preferred 50mm squares for the legs, which could then have been tapered like those on the shorter stool shown, but I used what I had readily available. I considered other timbers for the legs, but didn’t care for the look of elm, silky oak, or casuarina alongside the camphor. 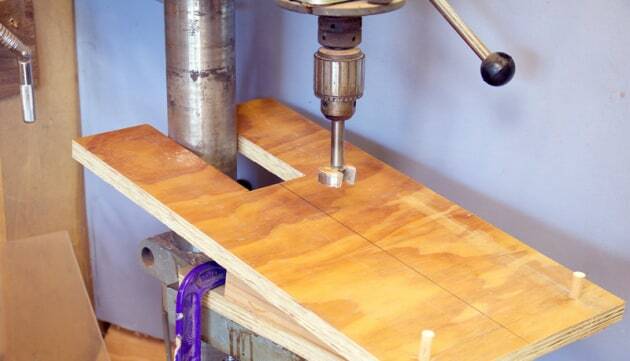 Make sure the grain runs the length of each leg, as any cross-grain will weaken the leg. The underneath of the seat is turned first incorporating some detail that can be gripped by a chuck. Then the job is remounted so the top can be completed. So as not to waste material I glued a waste block to what will be the top of the seat so the blank could be held on a screw chuck, see photo 4 below. On a larger lathe you could forget waste blocks and mount the blank in large dovetail jaws or bowl jaws. 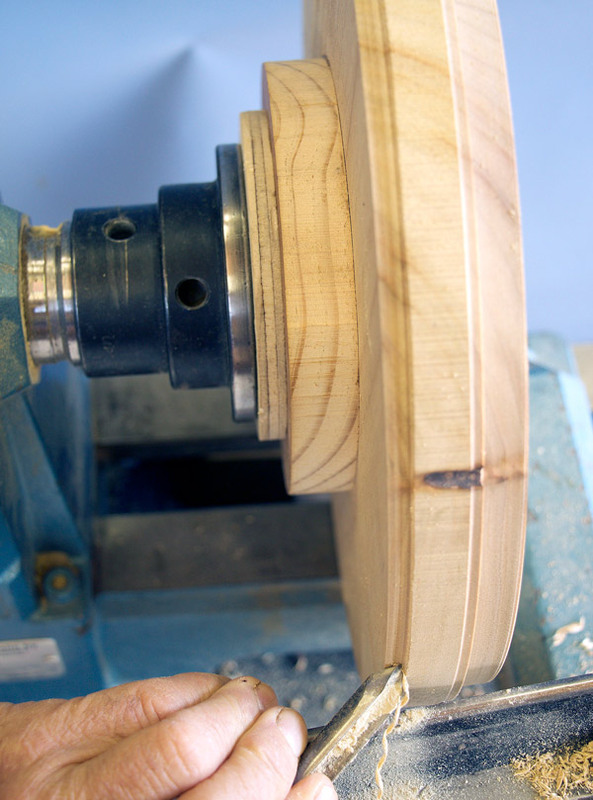 An altogether different approach would be to put the blank straight on a screw chuck, then later turn the screw hole into a decorative hole through the centre of the seat, like a sort of doughnut or bagel. 1. True the side. Get into the habit of truing any blank and removing any features you don’t want in your finished item. As I began to true the side a knot flew out leaving a less-than-attractive black cove. 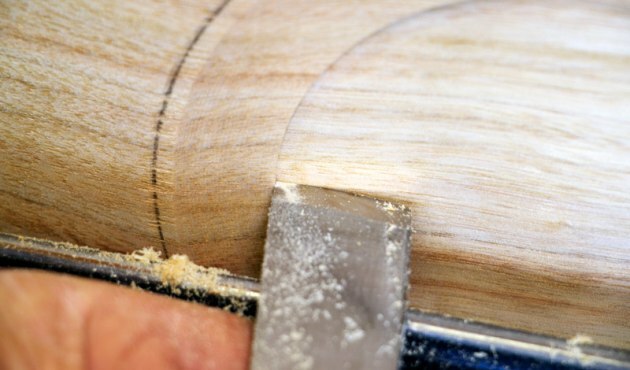 To avoid turning away more wood than required, I marked the lowest part of the defect (above, photo 3), then turned to that line. To avoid splintering the rims of the blank as you true the side, cut in from each face (photo 4). 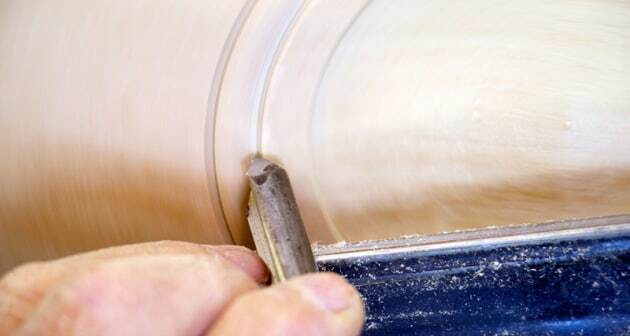 If you have the gouge bevel rubbing the wood and the tool pointing in the direction you’re cutting, you should end up with a smooth and cleanly cut surface. 2. Flatten the base. This blank was cut from a planed board so the faces were almost parallel and little needed to be removed. In this situation I always opt for a skewed scraper that I can ease across the face to skim off thin shavings and dust (photo 5). The edge of the scraper is slightly radiused so only a small portion is in contact with the wood. I plant my hand on the left of the T-rest and that’s where it stays as I hook the ends of my fingers over the blade so I can squeeze it towards my palm. Whenever you move your hand along the rest you lose a bit of control, so my left hand stays in one position per squeeze. 3. Chamfer the rim. The stool legs are splayed at about 10° off vertical and set at right-angles into a chamfer on the base. 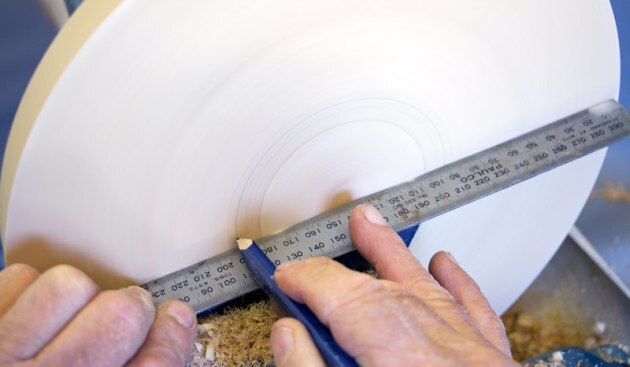 To lay out a 10° chamfer, measure 10mm up the side from the base and 65mm in from the rim (photo 6), then turn the chamfer between the two lines. Use a pull shear-cut to remove the bulk of the waste (photo 7), then a push-cut with the bevel rubbing the wood as in photo 8 below. A shear scraper using a skewed scraper, is a good way to finish the chamfer if your gouge-work is a bit ridgy. 4. Turn a fixing for the chuck. 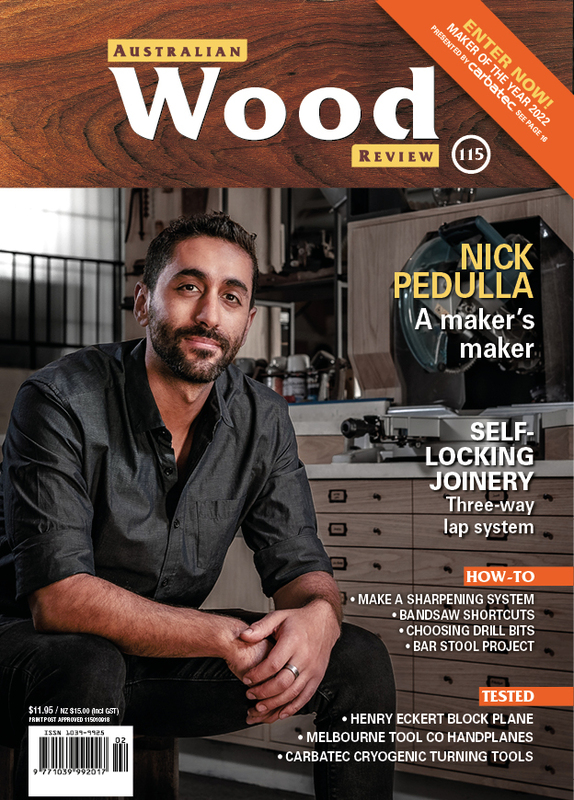 You need a decorative tenon for a chuck to grip, or a recess for a chuck to expand within. The larger the diameter on which the chuck grips, the more secure the job, so I opt for a concave recess of about 107mm for my Vicmarc VM100 Step Jaws. The recess is hollowed with a gouge, then the corner is dovetailed to accept the chuck jaws using the long point of the skew chisel, photo 9. Keep the chisel flat on the rest to avoid a catch. To disguise the fact that the recess is a fixing point, I’ll round over the dovetail rim when sanding, and in the meantime add a wide bead by way of decoration. To create a bead, turn a couple of grooves with convex sides (photo 10) by pivoting the point of a spindle gouge into the wood. 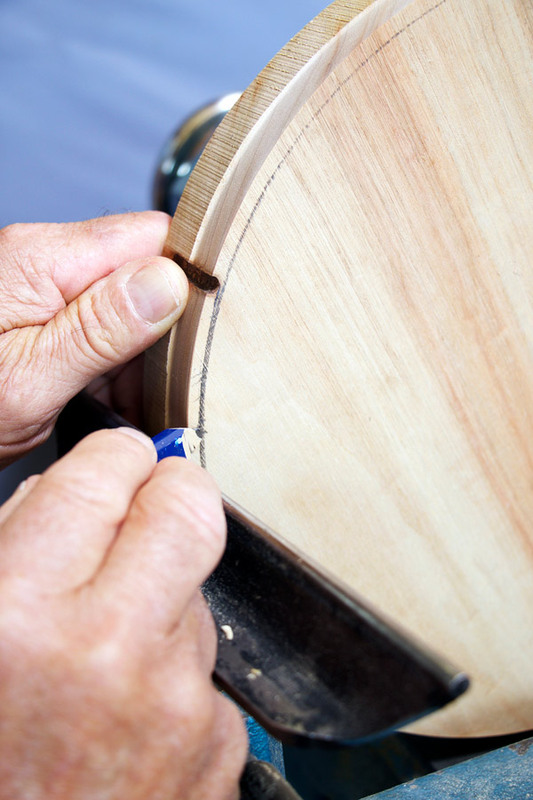 Keep the gouge on its side with the flute facing towards the groove. If you roll the gouge over at the bottom of the groove, the upper wing is likely to catch and you might utter some naughty words. 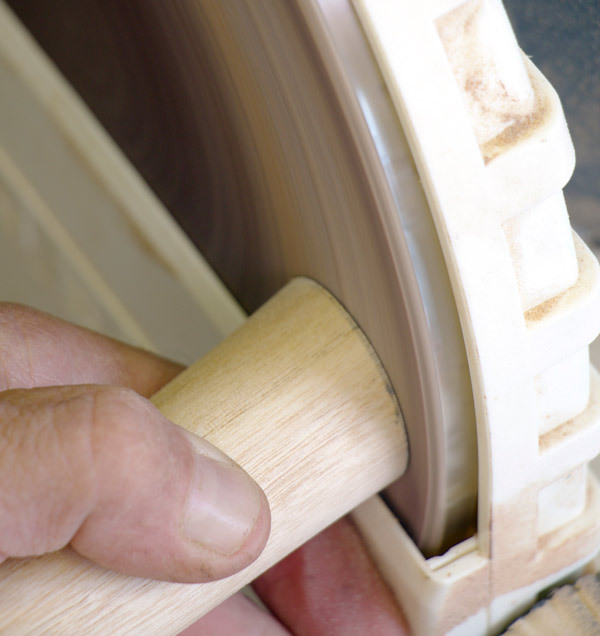 If you find turning the shoulders round too much of a challenge, sanding is a much simpler if less elegant solution. 5. Sand and finish the recess and the immediate surround that you cannot easily get at later. 6. Lay out the leg positions. When you lay out the positions for the legs, you need to know where centre is. You can leave a pencil dot at centre but it’s looking a bit plain, so I opt for a couple of grooves surrounding a small cone. 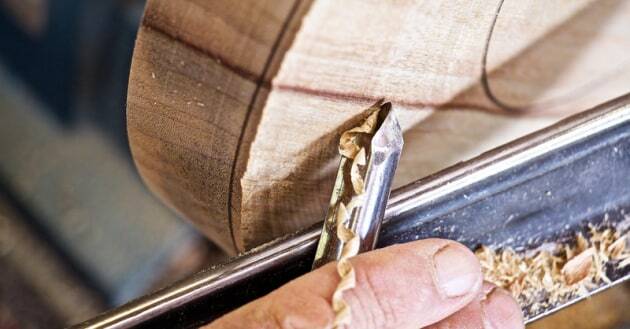 Ease the long point of the skew chisel into the wood, and keep the chisel flat on the rest to avoid a catch. The tenon on the legs will be 35mm diameter, so I set the circle on which they will sit 25mm from the bottom of the chamfer (photo 11). 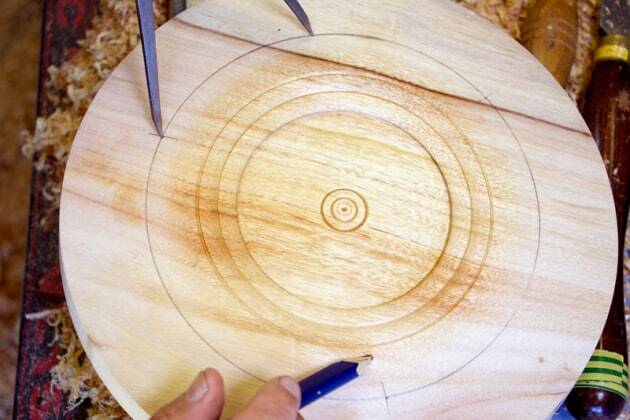 Then use dividers set to the radius of the circle you’ve just marked to set out the position of the legs. A radius will divide the circumference of its circle roughly into six (photo 12), so the legs are placed on every other intersection. Avoid having two legs on or near the same growth ring in case this induces splitting later. 7. Remount the blank, flatten the top. Before you can drill the mortises for the legs you need to flatten the top. Remove the waste block with a series of pull shear-cuts and push- cuts with the bevel rubbing the wood, similar to those in photos 7 and 8 only with the push-cut working towards centre. 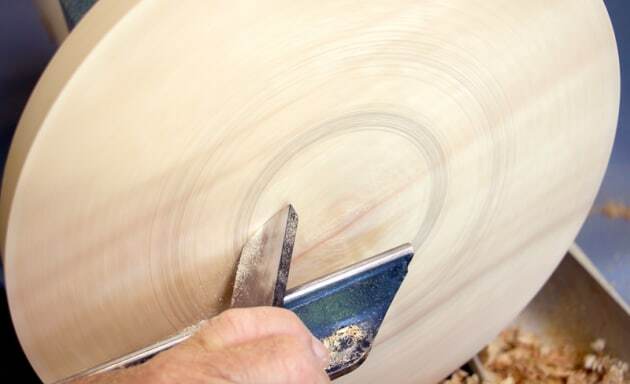 Check that the top is flat by holding a straightedge against the spinning wood (photo 13). High spots will be burnished and usually obvious as at 230/50, but you can also highlight them with a pencil. 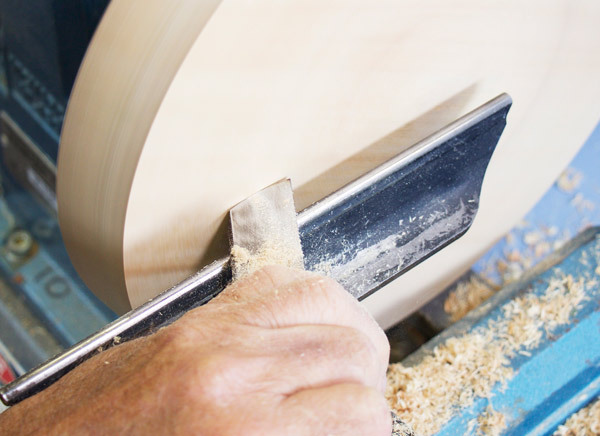 For a very smooth surface and less aggressive cut, tilt the skewed scraper on edge and stroke away the high spots using the lower half of the edge, photo 14. 8. Drill the mortises for the legs. I do a lot by eye, but drilling the legs freehand is a bit too loose even for me. Much safer is to make a simple jig (photo 15), that presents the chamfer on the underside of the seat at right-angles to the drill bit. This is clamped to a drill press. The two pins support the seat; the line between the pins is bisected at right angles by a line that can be aligned with the drill. When you have positioned and clamped the jig in position, set the depth stop so the drill stops at least 3mm short of the jig. Then drill the mortises (photo 16). 9. Remount the seat for sanding and finishing. To maintain a flat surface on the top, use a sanding block (photo 17), and sand as little as possible so as to avoid a hump developing at centre. It helps to stop the lathe and push the block across centre a number of times, revolving the job a few degrees between each push. I finished this stool, as I do almost everything, with a mix of boiled linseed oil and beeswax, first slopping on oil to fill the grain, then melting the beeswax into the wood on top of the oil. These blanks were barely 40mm square and I need to keep them as large a diameter as possible, partly for aesthetics and partly for strength. the mortises (photo 18). 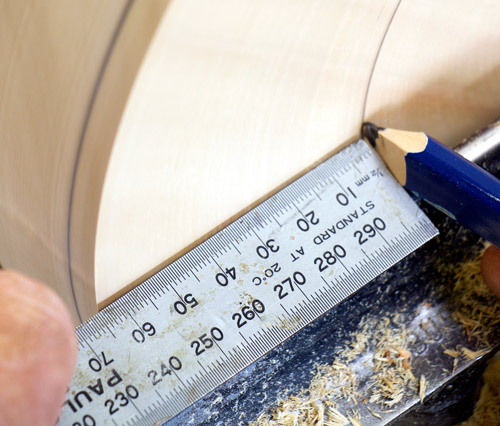 A wide gauge makes turning a cylindrical tenon easier. For a really tight fit, when the tenon is almost down to size put a slight chamfer on the end and test the fit in the stool mortise. Twisting the leg in the mortise will create a burnish mark, and that indicates the exact fit. 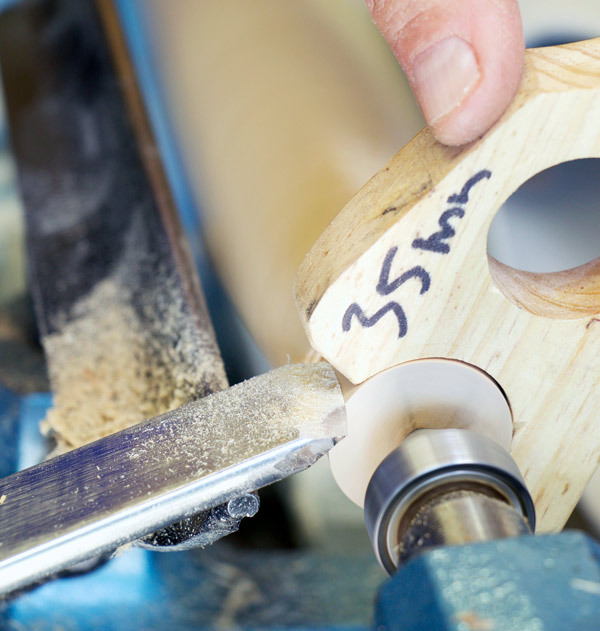 With the leg back on the lathe, turn the tenon down to the burnish mark (photo 19). To ensure the leg is seated right into the mortise when I assemble the stool I put a groove on the tenon just short of the mortise depth (photo 20). This will vanish into the mortise when the leg is in as far as it should be. The other groove is decoration. 2. Finish turning the leg. A skew chisel should do the best job and for cylinders and long coves I use mine long point down (photo 21). All I can manage on these legs is a slight narrowing two-thirds down from the seat. On 50mm diameter legs I’d have included a bead and more dramatic shape similar to those on the jarrah stool shown at the top. 3. Sand and polish the leg up to the tenon. You don’t want wax or oil where there will be glue. 4. Scratch a groove in the tenon (photo 22) so there’s an escape route for air compressed when the leg is pushed into its mortise. 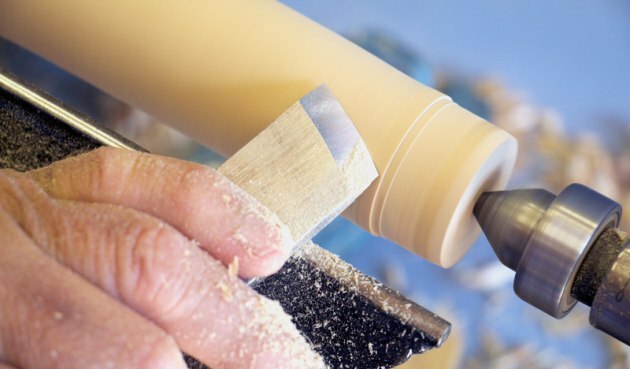 When you come to assembling the stool, smear a good quality wood adhesive around the mortise and drive in the legs until the mortise groove disappears. If you have an air groove, compressed air shouldn’t pop the leg out. Nevertheless it pays to put the stool on a flat surface with some weight on top to ensure the legs stay where they should be. The final task is to level the bottom of the legs so they sit flat on the floor — at this stage they rest on a small portion of the rim, and that’s guaranteed to split away sooner or later. Set the stool on a flat surface and use a pencil to draw around the leg, creating a line that’s parallel to the flat surface (photo 23). Then cut the end of the leg back to this line. I find a disk sander offers the most control (photo 24), and it enables me to leave the bottom of each leg slightly domed so the stool is easy to slide across a pile carpet or tiles.